I've always loved wandering thru an old cemetery so this week's challenge is right up my alley -- or shall I say gravestone. These pictures were taken at a yearly event called "Day of the Dead" which takes place on November 1st -- or All Soul's Day. All Soul's Day is celebrated amongst the Catholic people and it's a ceremony where the living honor those who have passed away. There is a way to pre-schedule your posts: when you are in the Create a post page, look near the bottom left side, there is a place to click on that says "post options" If you go there it will have a place for date and time that you can alter to post on whatever day and time you want. I usually use this option for Sunday Stills Challenge. Thank you Shirley for the info. I didn't realize I could schedule a post. This is very helpful. Thanks much. I love the pictures in the cemetery beautiful statues. Very nice photos! 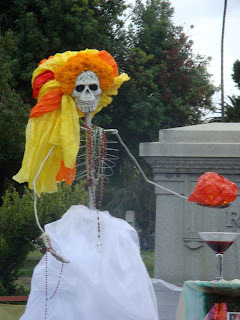 I like the day of the dead ones best! Cemetaries are great places to wander through. 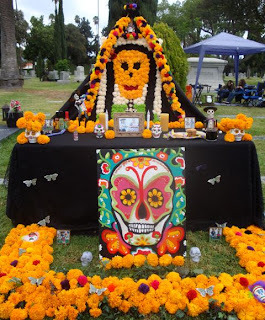 We don't have Day of the Dead celebrations here, so those pics were nice to see. These are very, very nice, any day of the week!Well done! Very nice. I found the Day of the Dead interesting. All are just lovely, but I absolutely love the black & whites!! !